The Horsehead Nebula (also known as Barnard 33) is without doubt one of the most recognized and fascinating objects in the sky. 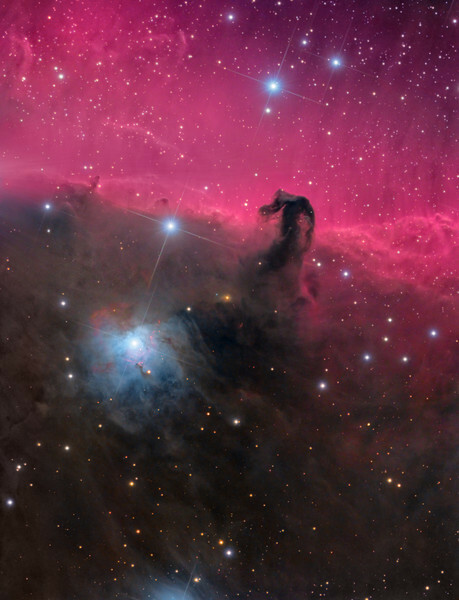 This iconic feature is formed by the sharp outline of a dark dust cloud, with a remarkable likeness to a horse's head, silhouetted against a brightly glowing patch of ionized Hydrogen (IC434) that is being energized by the hard ultraviolet radiation from nearby Sigma Orionis, a quintuplet star system lying just outside the top of the image. I sought to process this image to show not only the Horsehead silhouette but also the details of the dense dust cloud (Lynds 1630 molecular cloud) from which it emerges. The background behind the Horsehead glows with a soft diffuse reddish/pinkish light because of strong emission by spectral lines from ionized Hydrogen. Visible in the foreground is the large looming shadow being cast by the Horsehead's tower of dust, appearing as a dark fan-shape down towards the bottom centre-left, intercepted on its left edge by the intricate bright blue reflection nebula NGC2023. In contrast to the red emission glow, the reflection nebula is caused by light from the nebula's bright blue central stars which is being reflected off the surrounding dust.The brightest member of the central cluster is the B star HD 37903, a very young star with intense ultraviolet radiation that has carved a four light years wide cavity in the dust that we see as the reflection nebula. Throughout the dark cloud, both in and below the Horsehead, are several small glowing reddish patches. These are the feeble lights from new stars being born in the cloud. Some of these are Herbig-Haro objects; the result of plasma jets ejected from young protostars which collide with the surrounding gas and dust and cause the glowing emission. Inside the bright blue nebula NGC2023 are also several brightly coloured wisps of emission patches, further hints of young stellar objects and the regions' overall complexity and beauty. She was never credited with the discovery though because Dreyer did not include her name when he compiled the Index Catalogue (IC) in 1895 and 1908.